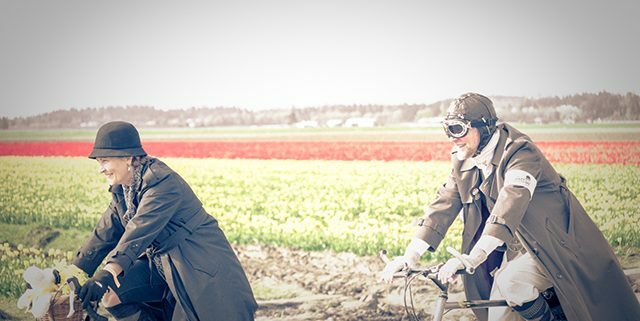 Join us in La Conner, among the daffodil fields of Skagit Valley, for a dashing bicycle ride with a bit of style – the 5th Annual Dandy Daffodil Tweed Ride! It’s a perfect place to be planted and a beautiful place to bloom. Tally-ho! What would be better than a group ride among fields of daffodils in which the cyclists dress in classic tweed or any smart looking outfit. Any effort made to recreate the spirit of yesteryear is also always appreciated. Any and all bicycles are acceptable on the Tweed Ride. It’s a smashing way to throw a party for all our cycling friends to celebrate the arrival of Spring. It’s time to buff your leather, brush your corduroy, and hitch your chequered stockings… but remember TWEED is KING! The Festivities commence in front of the Orange Rainbow Espresso, located at 604 South First Street at the most respectable hour of 9(ante meridiem). We shall ride like the wind! Well… a slow, polite, and Jolly wind, anyway. Please be prompt. We have been granted with a very horizontal riding surface. Many millennia ago, the ice age melted and produced miles of delightful riding. Alright the ice age had nothing at all to do with it, but there are plenty of smashing flat roads and beautiful scenery to savor. This will give you an ample amount of time to enjoy the ride. After the photographs of daffodil’s are taken, you might fancy a picnic brunch mid way through the journey. Spread a blanket and enjoy a spot of tea and cookies. Perhaps a scone or lemonade? Maybe you’ll partake in a ripping good game of croquet or badminton? Our great adventure shall conclude around 2PM with our Dear Friends at Hellam’s Vineyard, located at 109 North First Street. This is where the hobnobbery and other diversions await! Isn’t it amazing how these things work out? You are cordially invited to attend the 5th Annual Dandy Daffodil Tweed Ride! Répondez s‘il vous plaît. Or if you prefer, RSVP. We need to know how much tea to brew. You can mail-in your entry or register online. Perhaps you are saddened because you would like to join the Daffodil Tweed Ride, but your bicycle is in disrepair? Or are you the type who would rather take a leisurely stroll along the boardwalk? You are certainly welcome to join us anyway. Put on your snazziest outfit and bring a $5 donation for the La Conner Library Foundation. You will be included in the wine tasting social. The best part of our little jaunt, highlights some of the breath taking views of Skagit Valley while still considering safety and comfort. The ride itself will assume a very casual pace fit for cyclists of all skill levels. The few mile loop will take roughly two hours (with stops) to complete with the start and end location being one and the same. Intersection Diplomats w/Signs will be present. As we trundle off among the fields of daffodils, there is a stop along the way, where pipes are smoked, hip flasks are sipped, and don’t be surprised if a croquet game starts. The Rexville Grocery, is more than a grocery store. This Historic Skagit Valley store offers great gourmet foods and serves as a community center. Wine tasting’s, and art openings are just part of smashing things you’ll find. Stop in for a picnic lunch or a cup of tea and enjoy the friendly Rexville spirit! Call ahead at (360) 466-5522, and they’ll have a picnic ready for you. Down the lane is Pleasant Ridge Farm providing a large selection of seasonal produce in the spring and fall. Top quality produce at an excellent price! La Conner Daffodil Festival March 2019 - 5th Annual! La Conner Daffodil Festival March 2019 – 5th Annual! Tillinghast Postal and Business Center Has a New Convenient Location!